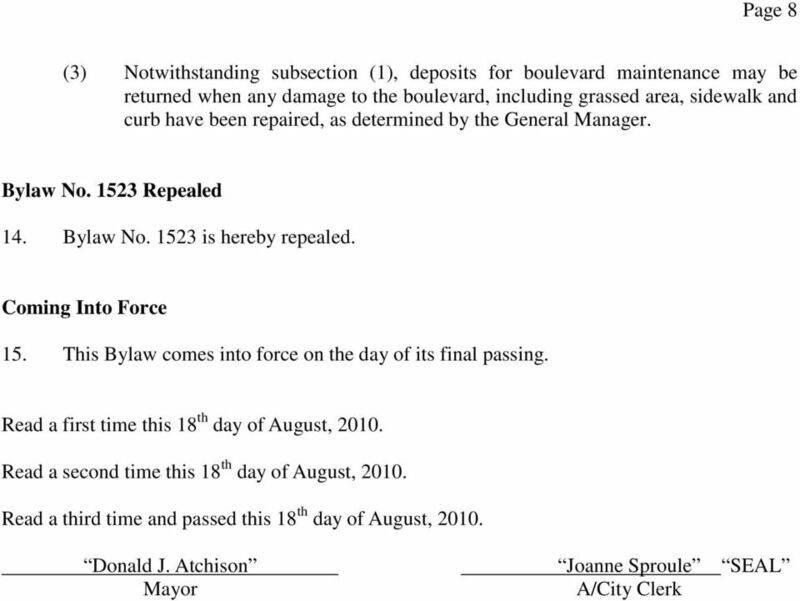 Download "Bylaw No. 8880. 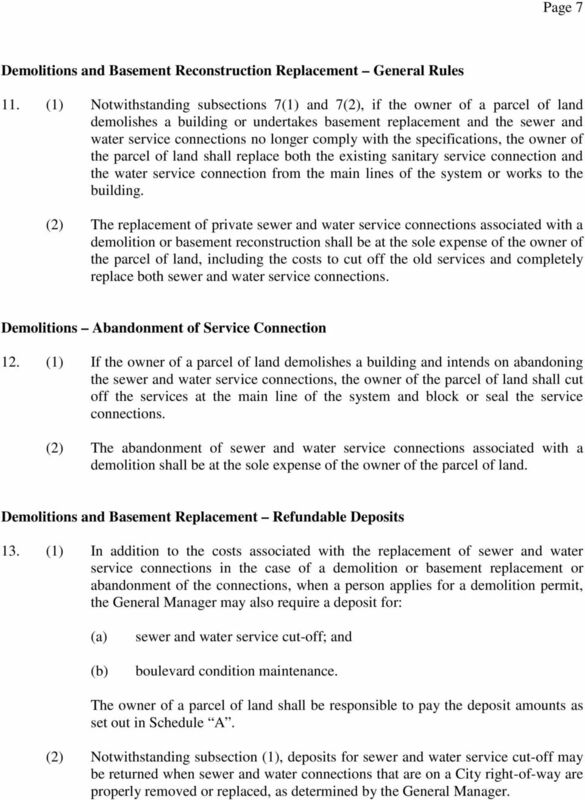 Private Sewer and Water Service Connection Bylaw, 2010"
3 Page 2 (c) basement replacement means the complete demolition and reconstruction of the foundation and walls of a basement; (d) (e) (f) (g) (h) (i) (j) (k) (l) (m) General Manager means the General Manager Infrastructure Services Department or a designate; live tapping means connecting the lines of a water service connection located above, on or underneath a parcel of land to the main lines of the water works system while the water main remains pressurized during the connection; parcel of land means a parcel of land within the meaning of The Cities Act; public sewage system means any City asset or facility for the collection, transmission, treatment and disposal of domestic and non-domestic wastewater including the main lines of the system; sewer service connection means a service connection that connects a building on a parcel of land to the public sewage system; service connection means a service connection within the meaning of The Cities Act; specifications means the current version of the City of Saskatoon Standard Construction Specifications and Drawings for Roadways and Water and Sewer; tapping means connecting the lines of a service connection located above, on or underneath a parcel of land to the main lines of a public utility while the valve is closed and the main line is depressurized; water service connection means any water system or pipe line on a parcel of land through which water is conveyed from the water works system; and water works system means any City asset or facility for the collection, transmission and treatment of water including the main lines of the system. 4 Page 3 Part II Construction/Installation of Private Sewer and Water Service Connections General 4. (1) The General Manager may establish specifications governing the construction, installation and repair of service connections and any fees associated therewith. (2) Every sewer and water service connection must be constructed, installed and repaired in accordance with such specifications. (3) A licensed contractor shall be responsible to pay all fees associated with the construction, installation and repair of sewer and water service connections as set out in the specifications. (4) All sewer and water service connection work, including the construction, installation, maintenance, repair and replacement must be undertaken by a licensed contractor. Licensed Contractors 5. 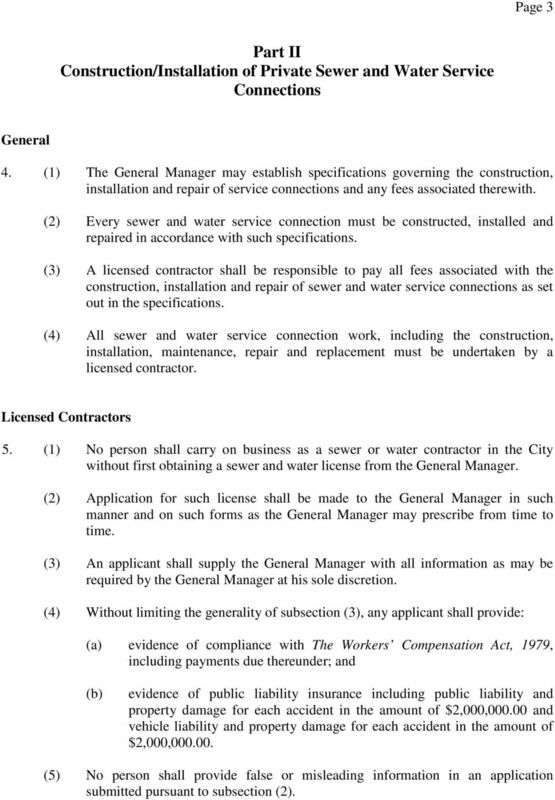 (1) No person shall carry on business as a sewer or water contractor in the City without first obtaining a sewer and water license from the General Manager. (2) Application for such license shall be made to the General Manager in such manner and on such forms as the General Manager may prescribe from time to time. (3) An applicant shall supply the General Manager with all information as may be required by the General Manager at his sole discretion. (4) Without limiting the generality of subsection (3), any applicant shall provide: (a) evidence of compliance with The Workers Compensation Act, 1979, including payments due thereunder; and evidence of public liability insurance including public liability and property damage for each accident in the amount of $2,000, and vehicle liability and property damage for each accident in the amount of $2,000, (5) No person shall provide false or misleading information in an application submitted pursuant to subsection (2). 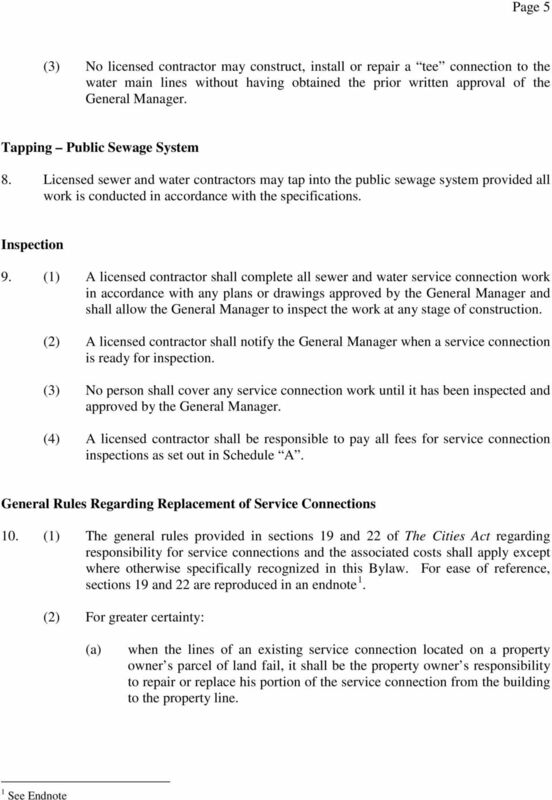 5 Page 4 (6) Where any contractor is not qualified, or deemed unsuitable to undertake sewer and water service connection work by the General Manager, the General Manager may, in his sole discretion, refuse to issue a license. (7) The General Manager may issue a license upon such terms and conditions as the General Manager considers appropriate. 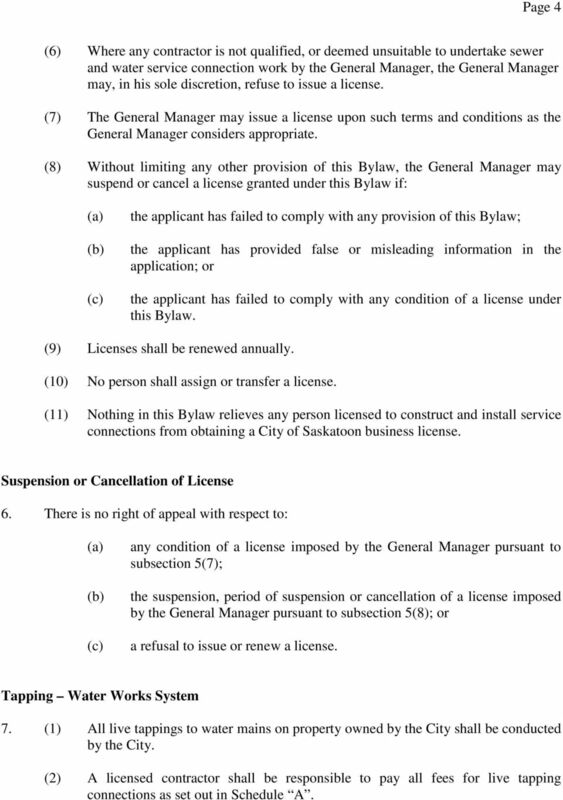 (8) Without limiting any other provision of this Bylaw, the General Manager may suspend or cancel a license granted under this Bylaw if: (a) (c) the applicant has failed to comply with any provision of this Bylaw; the applicant has provided false or misleading information in the application; or the applicant has failed to comply with any condition of a license under this Bylaw. (9) Licenses shall be renewed annually. (10) No person shall assign or transfer a license. 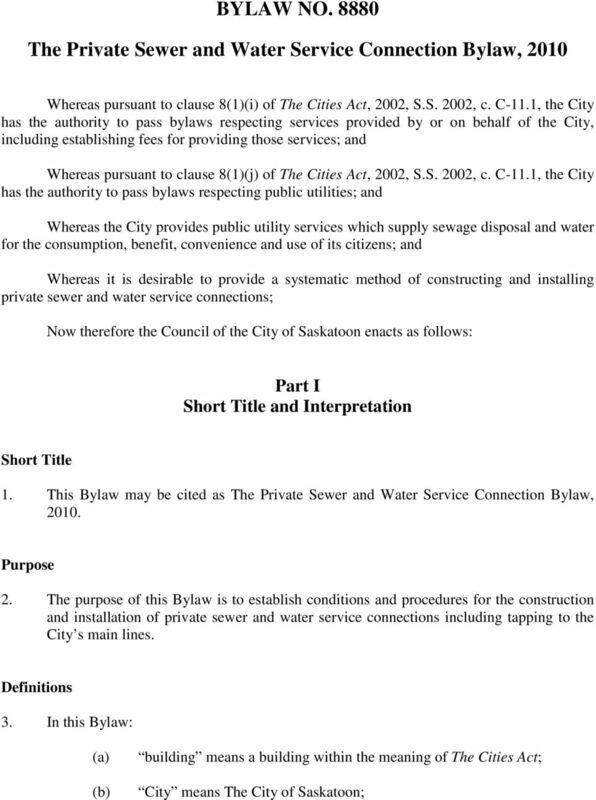 (11) Nothing in this Bylaw relieves any person licensed to construct and install service connections from obtaining a City of Saskatoon business license. Suspension or Cancellation of License 6. There is no right of appeal with respect to: (a) (c) any condition of a license imposed by the General Manager pursuant to subsection 5(7); the suspension, period of suspension or cancellation of a license imposed by the General Manager pursuant to subsection 5(8); or a refusal to issue or renew a license. Tapping Water Works System 7. (1) All live tappings to water mains on property owned by the City shall be conducted by the City. 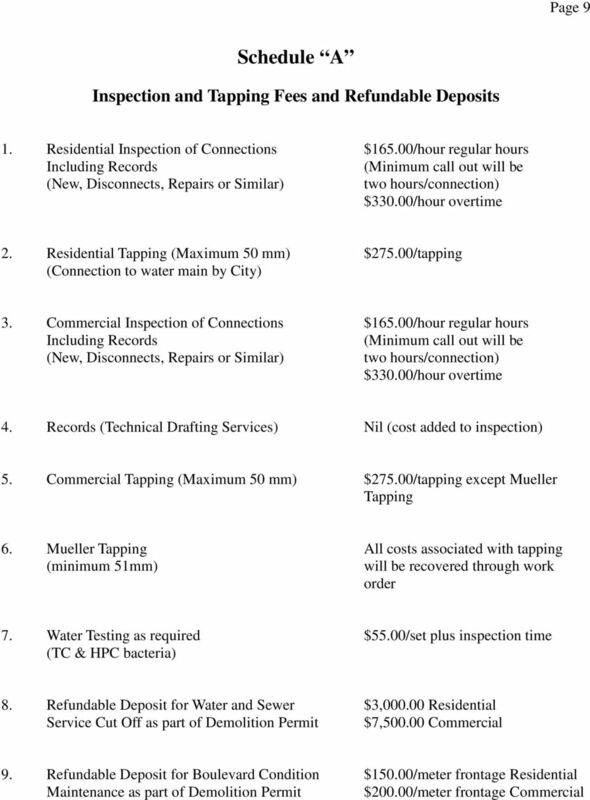 (2) A licensed contractor shall be responsible to pay all fees for live tapping connections as set out in Schedule A. 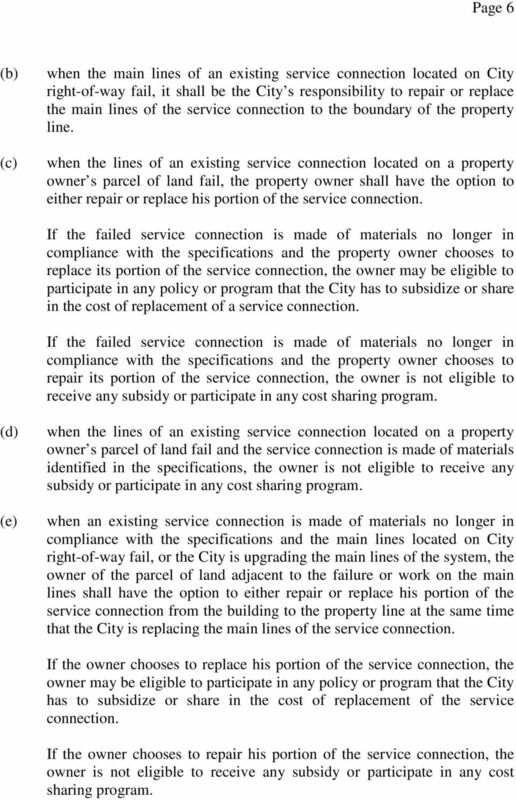 7 Page 6 (c) when the main lines of an existing service connection located on City right-of-way fail, it shall be the City s responsibility to repair or replace the main lines of the service connection to the boundary of the property line. when the lines of an existing service connection located on a property owner s parcel of land fail, the property owner shall have the option to either repair or replace his portion of the service connection. If the failed service connection is made of materials no longer in compliance with the specifications and the property owner chooses to replace its portion of the service connection, the owner may be eligible to participate in any policy or program that the City has to subsidize or share in the cost of replacement of a service connection. If the failed service connection is made of materials no longer in compliance with the specifications and the property owner chooses to repair its portion of the service connection, the owner is not eligible to receive any subsidy or participate in any cost sharing program. (d) (e) when the lines of an existing service connection located on a property owner s parcel of land fail and the service connection is made of materials identified in the specifications, the owner is not eligible to receive any subsidy or participate in any cost sharing program. when an existing service connection is made of materials no longer in compliance with the specifications and the main lines located on City right-of-way fail, or the City is upgrading the main lines of the system, the owner of the parcel of land adjacent to the failure or work on the main lines shall have the option to either repair or replace his portion of the service connection from the building to the property line at the same time that the City is replacing the main lines of the service connection. If the owner chooses to replace his portion of the service connection, the owner may be eligible to participate in any policy or program that the City has to subsidize or share in the cost of replacement of the service connection. If the owner chooses to repair his portion of the service connection, the owner is not eligible to receive any subsidy or participate in any cost sharing program. 8 Page 7 Demolitions and Basement Reconstruction Replacement General Rules 11. (1) Notwithstanding subsections 7(1) and 7(2), if the owner of a parcel of land demolishes a building or undertakes basement replacement and the sewer and water service connections no longer comply with the specifications, the owner of the parcel of land shall replace both the existing sanitary service connection and the water service connection from the main lines of the system or works to the building. (2) The replacement of private sewer and water service connections associated with a demolition or basement reconstruction shall be at the sole expense of the owner of the parcel of land, including the costs to cut off the old services and completely replace both sewer and water service connections. Demolitions Abandonment of Service Connection 12. (1) If the owner of a parcel of land demolishes a building and intends on abandoning the sewer and water service connections, the owner of the parcel of land shall cut off the services at the main line of the system and block or seal the service connections. (2) The abandonment of sewer and water service connections associated with a demolition shall be at the sole expense of the owner of the parcel of land. Demolitions and Basement Replacement Refundable Deposits 13. (1) In addition to the costs associated with the replacement of sewer and water service connections in the case of a demolition or basement replacement or abandonment of the connections, when a person applies for a demolition permit, the General Manager may also require a deposit for: (a) sewer and water service cut-off; and boulevard condition maintenance. The owner of a parcel of land shall be responsible to pay the deposit amounts as set out in Schedule A. (2) Notwithstanding subsection (1), deposits for sewer and water service cut-off may be returned when sewer and water connections that are on a City right-of-way are properly removed or replaced, as determined by the General Manager. 11 Bylaw No Endnote 1. Section 19 and 22 of The Cities Act reads: 19(1) If the main lines of the system or works of a public utility are located above, on or underneath a street or easement and the city provides the public utility service to a parcel of land adjacent to the street or easement, the city is responsible for the construction, maintenance, repair and replacement of the portion of the service connection from the main lines of the system or works to the boundary of the street or easement. (2) Notwithstanding subsection (1), the council may, as a term of supplying the public utility service to the parcel of land, make the owner responsible for the costs of the construction, maintenance, repair and replacement of the portion of the service connection from the main lines of the system or works to the boundary of the street or easement. (3) If the council acts pursuant to subsection (2), the costs mentioned in that subsection are an amount owing to the city by the owner. 22(1) The owner of a parcel of land is responsible for the construction, maintenance, repair and replacement of a service connection of a public utility located above, on or underneath the parcel of land, unless otherwise determined by the city. 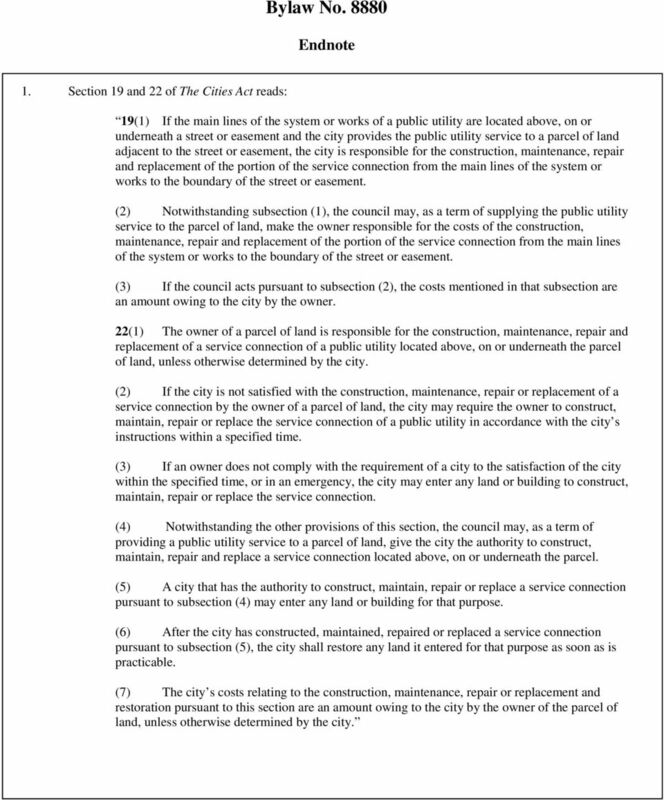 (2) If the city is not satisfied with the construction, maintenance, repair or replacement of a service connection by the owner of a parcel of land, the city may require the owner to construct, maintain, repair or replace the service connection of a public utility in accordance with the city s instructions within a specified time. (3) If an owner does not comply with the requirement of a city to the satisfaction of the city within the specified time, or in an emergency, the city may enter any land or building to construct, maintain, repair or replace the service connection. 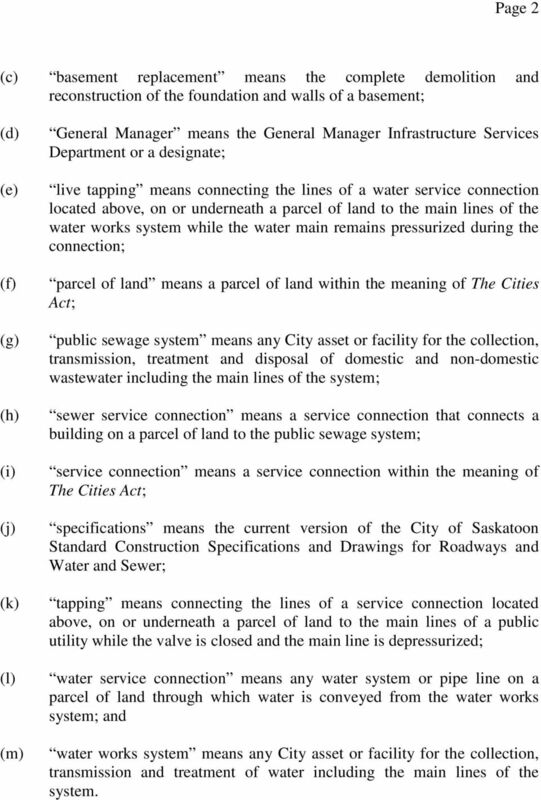 (4) Notwithstanding the other provisions of this section, the council may, as a term of providing a public utility service to a parcel of land, give the city the authority to construct, maintain, repair and replace a service connection located above, on or underneath the parcel. (5) A city that has the authority to construct, maintain, repair or replace a service connection pursuant to subsection (4) may enter any land or building for that purpose. (6) After the city has constructed, maintained, repaired or replaced a service connection pursuant to subsection (5), the city shall restore any land it entered for that purpose as soon as is practicable. (7) The city s costs relating to the construction, maintenance, repair or replacement and restoration pursuant to this section are an amount owing to the city by the owner of the parcel of land, unless otherwise determined by the city. Bylaw No. 6673. A bylaw of The City of Saskatoon to provide for the payment of taxes and the application of discounts and penalties thereto. The following sections are an overview of the relevant sections of the Act and Regulations concerning Restricted Certificate holders. This is not intended to be an exhaustive review of every requirement. STATE OF OKLAHOMA nd Session of the rd Legislature () COMMITTEE SUBSTITUTE FOR HOUSE BILL NO. 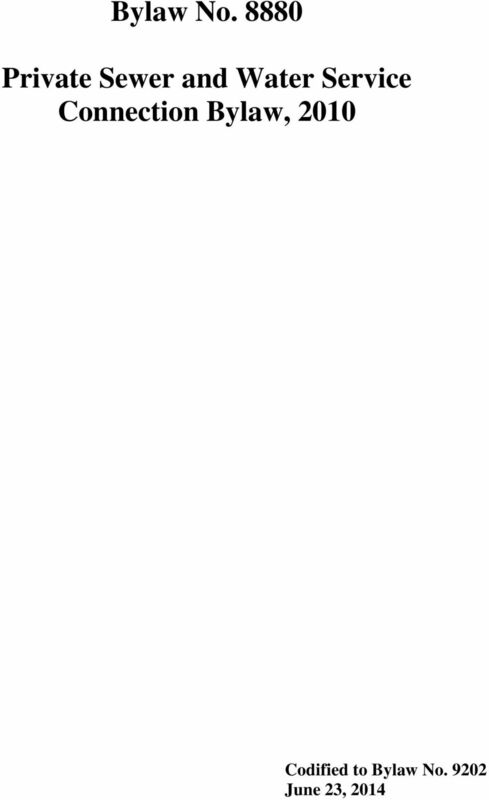 0 By: Stiles COMMITTEE SUBSTITUTE An Act relating to professions and occupations; amending O.S., Sections.,.,.,.,.,.,.,.,. CITY OF NIAGARA FALLS. By-law No. 2007-41. A by-law to regulate the maintaining of land in a clean and clear condition.